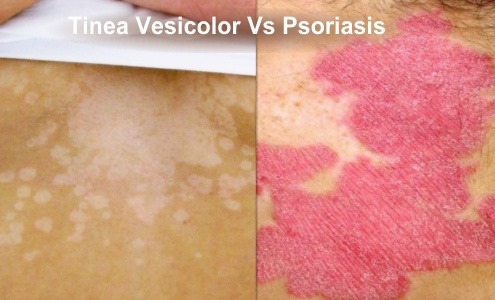 A type of psoriasis called guttate psoriasis and tinea versicolor can look very similar. However, they have very different causes and treatments. Both guttate psoriasis and tinea versicolor cause a rash of small, red spots, which is why some people may confuse the two conditions. This article looks at psoriasis and tinea versicolor, exploring the risk factors, treatments, prevention, and other similar conditions. What are psoriasis and tinea versicolor? Psoriasis is a chronic health condition, while tinea versicolor is a temporary fungal infection. Both have similar symptoms. Psoriasis is a long-term autoimmune condition that causes a person's immune system to overreact. Psoriasis causes the skin cells to multiply too rapidly, resulting in patches of red, inflamed, scaly skin. Psoriasis can affect any area of the body and symptoms come and go over time, called flares. There are several types of psoriasis, including guttate psoriasis. This is the type of psoriasis that people are most likely to confuse with tinea versicolor because it causes small red dots to develop on a person's skin. Tinea versicolor is a condition caused by a fungal infection. It occurs when the yeast that lives on a person's skin grows out of control. It can develop anywhere on the body. Tinea versicolor may appear as a rash of small red and sometimes scaly spots that are very itchy. As a consequence, people can often confuse it with guttate psoriasis. Tinea versicolor can also cause patches of light or dark skin, which some people might confuse with vitiligo. Who is at risk for psoriasis and tinea versicolor? Psoriasis and tinea versicolor have different risk factors. Doctors do not yet know why some people develop psoriasis, and others do not. Genetics may play a part. Genetic issues in the skin and the immune system may increase the chances of a person getting psoriasis. Guttate psoriasis can also develop after a person contracts a streptococcal bacterial infection. To diagnose guttate psoriasis, the doctor will usually refer a person to a specialist skin doctor called a dermatologist. The dermatologist will examine the affected areas of skin and take a complete medical history to rule out other possible conditions. A dermatologist may order a skin biopsy, which is a procedure that involves taking a small sample of skin and sending it to a lab for testing. This will help rule out any other possible reasons for the skin problems. It will also help a dermatologist work out which type of psoriasis a person has. A dermatologist can usually diagnose tinea versicolor by looking at a person's skin. If they are unclear on the diagnosis, they may scrape off a bit of skin to examine under a microscope. Alternatively, they might examine the skin using a Wood lamp, which is a diagnostic tool that emits a specific type of light. A doctor can make a diagnosis if the affected skin appears yellowish-green when looked at it under the lamp. Although psoriasis and tinea versicolor have similar symptoms, the underlying causes and treatment options are very different. Doctors can recommend a range of treatments for psoriasis, and people can also buy various over-the-counter treatments. The type of treatment a doctor prescribes depends upon the type of psoriasis a person has, its location, and any other complicating factors. Doctors usually prescribe a topical antifungal medication to treat tinea versicolor. These can come in the form of soaps, creams, and shampoos. If the yeast infection returns, a person may need to use a medicated cleanser occasionally. A doctor may prescribe antifungal tablets for severe tinea versicolor. There is no guaranteed way to prevent psoriasis. People can manage psoriasis flares by identifying and avoiding the triggers, such as skin injuries, stress, or smoking. This should reduce the number of flare-ups a person experiences. Inflammation causes many of the symptoms of psoriasis, so trying to avoid scratching the skin can also prevent symptoms from getting worse. According to an article in the West Virginia Medical Journal, sometimes a person may confuse guttate psoriasis with a reaction to antibiotics prescribed to treat a streptococcal bacterial infection. Speaking to a medical professional is the best way of working out what is causing a rash or infection. Although there is no cure for psoriasis, most people can manage their symptoms and flares by taking regular medications. If a person's medication is not reducing symptoms or preventing flare-ups, or if they experience side effects, they should speak to a healthcare professional. Antifungal medications can usually treat most cases of tinea versicolor. However, if a prescribed medication is not working, or if a person experiences any side effects, they should also speak to a doctor. Although guttate psoriasis and tinea versicolor look similar and share some symptoms, they have very different causes. People can manage both conditions by using prescription or over-the-counter medication.